In this first volume of “The Best of Wim’s Blog”, Wim compiles some of the best posts from his blog. He covers martial arts and self-defense as primary topics but connects them with many other aspects such as training, teaching, health, psychological factors and much more. 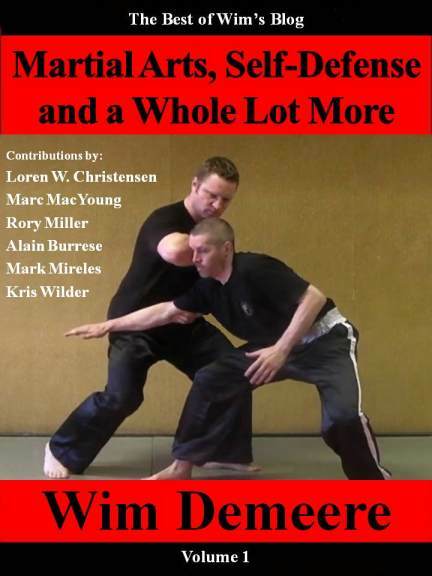 If you practice martial arts or are interested in self-defense, you’ll find this a thought-provoking book that helps you improve your skills and knowledge. Click the image to buy Wim's new book! Right now, this book is only available on Amazon’s Kindle but other formats and a paper version will follow soon. Instead of trying to go at it alone, there’s a better way: get help from an experienced Personal Trainer. Get in shape. Be stronger. Have more endurance. Lose weight in a healthy manner and keep it off. Get rid of stress in a pleasant and enjoyable way. Then Personal Training is exactly what you need to achieve your goals. Take your first 10-session package now and get 2 sessions for free! Don’t hesitate and contact us now for more information. Wim Demeere works as a Personal Trainer since 1994 in Belgium, mostly in the region Antwerp and Brussels. Now the calm of the Summer holidays is over, it’s time to get back in shape. But as we all know, it’s easier to make good health resolutions than to actually apply them in real life. Instead of trying to go at it alone, there’s a better way: let an experienced Personal Trainer help you. Lose weight in a healthy and lasting way. Choosing a Personal Trainer is not something you want to leave to chance. He’s the person who will help you optimize your body, mind and overall health. In other words, he takes on a huge responsibility. Then it’s only natural you choose somebody you can depend upon, a professional who is capable of handling this responsibility? But how do you find this person? Experience. As with any profession, experience is invaluable. You can’t expect a beginning Personal Trainer to have the same knowledge and skill as one who’s been working for over a decade. This doesn’t necessarily mean the junior Trainer can’t help you, but you better ask in-depth questions first to establish the reach of his capabilities. A more experienced Trainer knows how to motivate you and how to help you reach your goals, no matter how specific they are. This knowledge and experience usually carries a slightly higher price tag but the much improved effectiveness of his services are more than worth it. References. If he does a good job, he’ll be happy to provide you with several references. Obviously, privacy is crucial and a large number of clients will prefer to stay anonymous. However, he should be able to give you a list of references to check upon. Contact at least two or three of these to establish his bona fides. Even though this doesn’t offer a guarantee, it will give you a clearer picture of what you can expect. Based on this additional information, you can then decide whether you want to start working together. Personality. Even if he has the required technical skills and experience, this still doesn’t automatically translate into a positive experience for you. You also have to hit it off and connect on a personal level. Some Personal Trainers are exuberant and perhaps too enthusiastic whereas others are more reserved and factual. You have to decide which personality type you’re most comfortable with. This is important because you’ll spend a lot of one-on-one time with him. If you don’t enjoy spending time with a Trainer, then you won’t want to work with him long term and finding somebody else is probably better.